I created Good Fortune in my kitchen in 2006. Through faith, persistence, and a little bit of crazy, I've grown Good Fortune into a relaxing boutique and spa that has been labeled the "American Dream." Seeing my vision come to life is amazing, but inspiring others to follow their dreams is most rewarding! Giving back is a concept that was built into the foundation of Good Fortune, in fact, that is where we got our name. From the moment God whispered His plan, He also asked me to bless others. Good Fortune supports several charities and celebrates empowering women! FEEDING OTHERS: Food For the Face, our organic skin care line, donates 10 pounds of food for every set sold. We love food, in any and all forms! RENEW MINISTRIES: Jen worked with the amazing Renew women to make candles in our downtown store. The women are now making the candles on their own, and we sell their soy candles, and 80% of the money goes back to them. 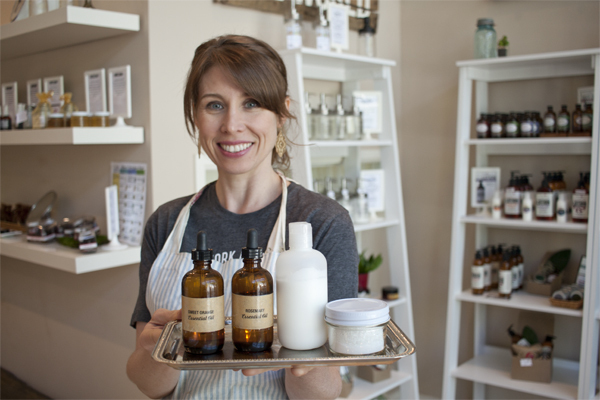 SHOP: You are welcome to stop by our beautiful store in downtown Chattanooga to shop our huge assortment of natural body products or make your own perfume. We have a unique essential oil bar with over 100 oils for you create your own custom scented body products, and therapeutic essential oil blends. We also offer private spa parties for birthdays, brides, and girls night out. SPA: Schedule a relaxing massage, organic facial, or spa day for the best hour of your day. We have a small two-room boutique spa located inside Good Fortune Soap & Spa. We hire the most amazing professional therapist to help you feel comfortable and provide you with top notch service. STAY: Rustic elegance, spa like features and convenience to everything Chattanooga has to offer! Our newly built luxury retreat sits atop Good Fortune Soap & Spa in the “Southside district” of Chattanooga and promises a noteworthy experience unlike any other. Our new boutique hotel was designed and built with you in mind. Relax Chattanooga offers one large 1,700 sq. ft. apartment with a private rooftop deck, or can be divided into two smaller units. This urban oasis provides sweeping views of the Downtown and Lookout Mountain, luxurious sleep accommodations, stylish design, spa like bathrooms, a full service spa in our store below and complementary bikes to cruise the cities vast riverwalk trails that lead to restaurants, bars and parks. Free parking is ample and provided.